1) How many enrolled, really? Rightly or wrongly, this figure has become a yardstick by which some are measuring the law’s success. But no one can give an accurate accounting yet. President Barack Obama announced Thursday that the administration had hit the 6 million enrollment mark — the revised projection of the nonpartisan Congressional Budget Office (which had initially forecast 7 million before the disastrous rollout of the online marketplaces last October). As of March 1, another 4.4 million consumers had been deemed eligible for Medicaid, the state-federal insurance program for low-income Americans. Final tallies of enrollees may come in mid-April, but those figures won’t be the last word either. That’s because not everyone who signs up for a private plan will pay their first premium, and they aren’t covered unless they do. In addition, consumers who signed up through insurers or on nongovernment sites are not yet included in the count. And finally, the administration on March 26 relaxed the deadline for some people, including those who encountered computer glitches while trying to enroll. 2) Who has signed up? Prior enrollment reports have shown the vast majority to be 35 and older with more women than men. Much attention will be focused on the coveted demographic, ages 18 to 34, who have accounted for just over a quarter of enrollees. While insurers hope for young enrollees, they can also benefit if older ones are in good health. Despite all the attention on national numbers, state and local enrollment figures are more important in any case because insurance markets are state-based, and big numbers or youthful enrollment in some places won’t make up for shortfalls in others. State markets are expected to vary significantly, with some seeing bigger premium increases next year because they have older and sicker enrollees, while others with a more robust mix are more likely to see rates hold steady. 3) Has the law put a dent in the number of uninsured? This is a key question for a law designed to reduce the nation’s 48 million uninsured. It will take a while, though, to track changes. 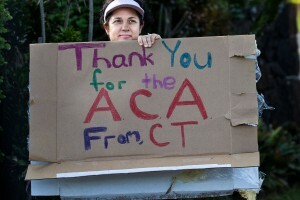 For one thing, no information has been released about how many of those who signed up were previously uninsured. Also, data so far includes those who signed up through the state and federal online markets, but not those who purchased coverage elsewhere, or who enrolled in job-based plans they had previously turned down. 4) Will insurance plans, prices and rules be the same in the next enrollment period which begins Nov. 15? No. Right now, insurers are assessing their new enrollment and associated health care costs for the first three months of the year, which will help them set rates for next year. Most of them must submit those rates for review by state regulators by spring or early summer. But don’t expect to see the new rates until next fall, just before open enrollment begins. Analysts say much will depend on who enrolled this year and how healthy they turn out to be. Some predict big premium increases in some areas, while others say insurers are protected from the impact of large claims by provisions of the law that insulate them from unexpectedly high medical costs. Rule changes for next year will also factor into rate decisions. Insurers warn they may have to raise prices if they’re forced to offer greater selection of doctors, hospitals and drugs in their networks. 5) Will Medicaid participation grow? As of March 1, 4.4 million people had been deemed eligible for Medicaid, but it’s unclear how many are newly eligible for the program or actually enrolled. That number doesn’t count people who have enrolled through their state Medicaid agency. Because there is no deadline for enrolling in Medicaid, final tallies for 2014 won’t be available until next year. The program for the poor continues to be a political battleground. Democratic architects of the health law envisioned Medicaid as a key tool for insuring more Americans, expanding eligibility to adults with incomes up to 138 percent of the federal poverty level, or $15,800 a year for an individual. Then, the U.S. Supreme Court made state participation effectively optional. While the District of Columbia and 26 states, most of them under Democratic control, moved forward, two dozen others declined to participate. A handful of states, including Pennsylvania, Virginia and Utah, are considering expansion next year. But lobbying by hospital groups and others have run into ideological headwinds and fears that state taxpayers would bear additional costs despite generous federal funding. 6) How will insurance change for those of us who get it through our employers? The answer depends on what your employer is doing now. If you work for a large company and have job-based insurance, your employer will probably keep offering it, according to most surveys. It’s trickier to say what will happen for workers at firms that don’t offer coverage. That’s because all employers were given a pass this year on rules that say if they don’t offer health coverage to full-time workers, they could face fines. The Obama administration then extended that exemption until 2016 for firms with 50 to 99 workers. (Those with fewer than 50 workers were never included and don’t face fines.) But starting next year, employers with 100 or more workers must offer insurance to at least 70 percent of workers — rather than the 95 percent originally called for under the law — or face fines. For those with job-based coverage, the health law is also expected to accelerate existing trends, including rising deductibles and copayments for employees. Employers are making those moves to slow rising premium costs and to shift more expenses to workers. Analysts also expect to see an increase in workplace wellness programs, which often give workers incentives to participate. The health law allows employers to offer larger incentives, or up to 30 percent of the cost of coverage. That means workers who choose not to participate or, in some cases, to meet certain health goals, will pay more toward their coverage. 7) What impact will the rollout have on congressional elections? Look for lots of advertising in vulnerable Democratic districts heading into the fall. If Republicans win control of the Senate (the GOP is expected to keep control of the House, if not increase its majority) that could mean health law defunding bills passed by the House will get a Senate floor vote. While Obama would surely veto them — and neither chamber is expected to have a veto-proof majority — the bills would keep anti-health law legislation front and center as both parties battle for the White House in 2016. This KHN story was produced in collaboration with USA Today. Kaiser Health News is an editorially independent program of the Henry J. Kaiser Family Foundation, a nonprofit, nonpartisan health policy research and communication organization not affiliated with Kaiser Permanente. Jay Hancock contributed to this report.